Project WADES (Watershed Action Dialogue Education and Stewardship) is a K-12 school-based environmental service-learning curriculum developed by the Lower Raritan Watershed Partnership (LRWP). Project WADES combines an Environmental Education (EE) curriculum with volunteer citizen science environmental monitoring, science communication and environmental action to foster deep learning around scientific inquiry and the natural environment. Project WADES directly engages area youth to advance watershed health! Through problem-based service learning, Project WADES engages Next Generation Science Standards (NGSS) for high school (9-12) science, technology, engineering and math instruction, and is consistent with core curriculum requirements for K-8. Working with local arts organization coLAB arts, we integrate arts communication approaches and tools to provide a true STEAM curriculum. 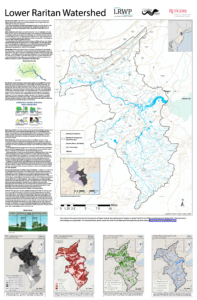 Through grant support from Rutgers Sustainable Raritan River Collaborative and McIntire Stennis (the New Jersey Agricultural Experiment Station), the LRWP is happy to provide a hard copy of this poster of the Lower Raritan Watershed to educators in any of our Lower Raritan Watershed high schools. The content of this poster is based on the final projects of Rutgers School of Environmental and Biological Sciences (SEBS) students who participated in Professor JeanMarie Hartman’s “Tracing the Raritan” (Fall 2016) and “Watershed Management” (Spring 2017). Their hard work is acknowledged and appreciated. Interested in bringing watershed education and stewardship to your classroom? Find out more about Project WADES by browsing our educator resource pages, where you can also access a video curriculum guide that explains how to use our watershed poster (see above) in the classroom, materials to guide watershed study for a variety of ages, and a list of the programs, workshops and field experiences the LRWP can assist with. Please contact us if you would like to get your school involved! The LRWP launched Project WADES in January 2016. To date we have implemented programming in over a dozen area schools, and with a variety of ages K-12. Project WADES students have collected and reported water quality data (including visual habitat assessments and macroinvertebrate sampling), built rain barrels, conducted stream clean-ups, designed and implemented rain gardens, created hundreds of sculptures incorporating trash found during clean-ups, created storymaps that trace how trash ends up in our waterways, and much more. This work speaks to two core goals of the LRWP: 1) fostering environmental appreciation and stewardship by cultivating a “culture” of science among residents of the Lower Raritan Watershed through community participation and collaboration in watershed research activities; and 2) communicating scientific findings about the watershed to residents and established decision-making bodies for informed decision making about policy, land use and landscape change. By working with area students to conduct stream monitoring and landscape assessments, and by working with them to report their findings through a variety of creative means, we improve science communication while cultivating “civic science” activities in the watershed. Project WADES was developed with grant support from Johnson & Johnson, and with technical assistance from Rutgers Cooperative Extension.